These hot summer days call for refreshing and quickly prepared meals. Summer being the season for loads of delicious fruits and veggies is the perfect time to experiment with combinations a little and maybe find one that is a bit unexpected but works perfectly together, like this sweet and salty salad here. Pair these delicious fruits and veggies with some protein packed meat and quinoa and you have yourself a delicious, healthy and guilt free summer dinner. Best part? You can cook and roast what needs to be cooked and roasted in advance and simply throw the salad together in under 15 minutes when you get hungry. This recipe is inspired by a recipe from Cooking Light. 1. Cook the quinoa in salted water according to instructions on the package. It should take about 12 – 15 minutes of boiling in about double the amount of water. Set aside to cool completely. 2. Season turkey strips to taste and roast until cooked through. Refrigerate. 3. 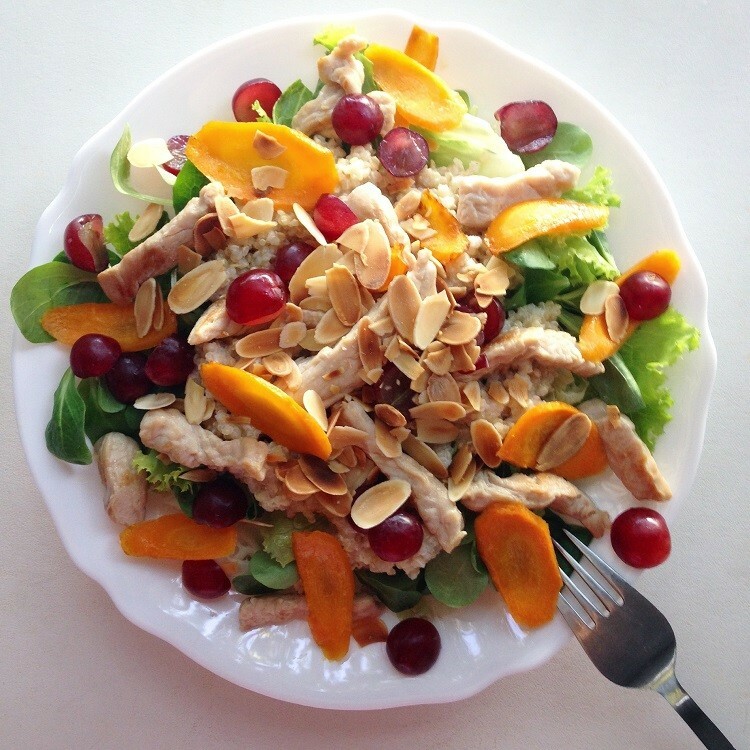 Once you are ready to eat the salad, heat a pan to medium heat and roast the almonds. Remove from pan, add olive oil and roast the carrots, seasoned with some salt. 4. In the meantime, mix together the greek yogurt, lemon juice, water, honey and black pepper with a whisk to make the dressing. Pour over quinoa and give it a good mix until evenly distributed. 5. Place the salad greens in two bowls, season with salt, olive oil and vinegar to taste, then top with the quinoa mixture, turkey strips, red grapes, carrots and roasted almonds. Serve immediately.